It is a wonderful thing to be part of the worship of Joy Fellowship! You will find an abundance of joy and warmly expressed love if you ever join us, and we believe you will be blessed. 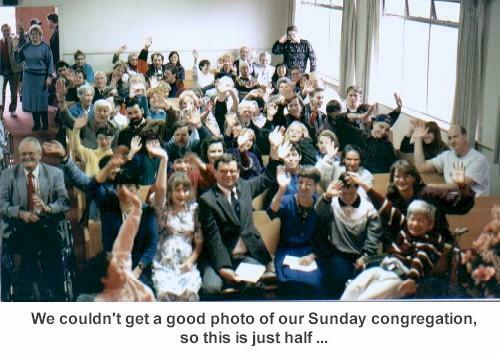 Our Sunday morning congregation usually involves between 110 and 130 people, although many more consider themselves part of us and are able to come only on occasion. 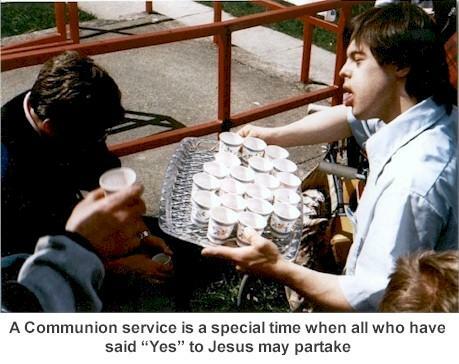 Joy Fellowship is a non-denominational church seeking to help people with disabilities and their families come to believe in Jesus Christ as Lord and Savior, and then to help one another grow in maturity. To meet these goals, we worship together each Sunday afternoon from 1:30 to 2:30 at Trinity Baptist Church at 1460 West 49th Avenue (49th and Granville). It is on major bus routes and is wheelchair accessible. While 75 percent of our congregation has an obvious disability, we have many others who have joined us and for whom we have become their church. On the 4th Sunday of each month, we have a morning service between 11:00 and 12:00 at George Pearson Center, 700 West 57th Avenue, in Vancouver. Worship. Our services usually begin with prayer, welcomes, and birthday greetings, followed by lots of joyful singing and worship. 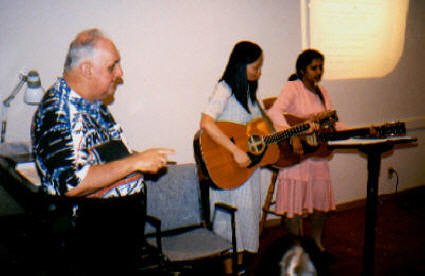 Our desire is to encourage the development of each person’s gifts and so congregational involvement is welcomed and enthusiastically offered to God. We love to sing (and sometimes to dance) with lots of clapping and actions and raising our hands. Teaching. Several of us take turns with the Bible teaching as we work through a book of the Bible, usually over several months. Recently we have studied the Gospel of John and the Epistle of James, had a series on suffering and another on the 10 Commandments, and are finishing a seven-month study of Jesus’ parables. Next we hope to spend three months examining the Trinity—Father, Son, and Holy Spirit—as we approach Advent. Other themes have included the Old Testament saints and heaven. Prayer. After the sermon we spend time in participatory prayer, during which anyone may speak a word of thanks, praise, or need, which allows many to use their gifts. We pray for one another, for old friends, and for world needs, and each person is encouraged to take part. We love to pray. Prayer is one of our gifts, and we devote time to encourage and to build this up. We pray for many people around the world, some of whom we have never met, and for people we may not have seen for more than 10 years. We also have a prayer calendar that comes out each month, and we send out regular prayer lists by e-mail to several hundred friends around the world. Communion. On the first Sunday of each month, we celebrate communion. Since we are an inter-denominational church, we invite anyone who believes in Jesus to share in this with us. Members of the congregation are involved wherever possible and regularly lead the communion service. Offerings. In addition to offerings from their precious financial resources (we depend largely on the gifts of others for our economic support since most of our members are on modest handicapped pensions), our members may bring offerings of cans and bottles to church for recycling. We use the proceeds from these offerings to support two young women with disabilities in Ramabhai Mukti Mission in India, and two young adults with disabilities in International China Concern (ICC) homes in Changsha, China. We have been raising almost $2,000 per year this way. We also have an offering we call Pennies for Heaven—people save up their pennies and small change, and sometimes large bills—and this is dedicated to special missions projects that come up from time to time. This also has been raising nearly $2,000 per year. At Christmas and sometimes Thanksgiving, we also invite people to bring food for a food bank or a church project to feed the hungry. Outreach Teams ● Special Events ● How Can I Help?